Greater Manchester Bus route 17 operates between Rochdale Interchange and Manchester Shudehill Interchange. From Rochdale Interchange it travels through Sudden and Castleton to Middleton bus station, and then continues through Blackley, Harpurhey and Collyhurst to Manchester Shudehill Interchange. It has a sister service 18 which operates on the same route between Manchester and Middleton, and serves Langley. One service per day (17A) serves Stake Hill Industrial Estate. The service was originally numbered in 1914 when the Manchester Corporation Tramways route from Manchester High Street to Middleton was numbered 17. In 1925, the Middleton tram route was joined to the routes of the former Middleton Electric Traction Company and on August 9, 1925 Manchester corporation trams began to run through to Rochdale displaying the number 17. At 10 miles 1449 yards, this became the longest tram route run by Manchester Corporation Tramways. Rochdale Corporation took part in this joint service although their trams did not display route numbers and showed only a final destination. On Sunday 13 November 1932 both Manchester Corporation and Rochdale Corporation buses were substituted for trams on this route, the number 17 was now displayed on the vehicles of both corporations but the Manchester terminus was changed to Cannon Street. 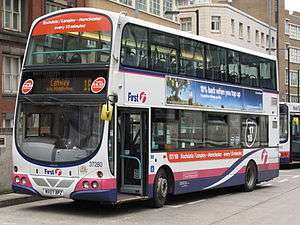 The service continued to be run as a joint service by Manchester City Transport and Rochdale Corporation Transport until 1969 when control was transferred to the new SELNEC Passenger Transport Executive. In the 1980/90s it was run by GM Buses before FirstGroup took over the company. The 17 is one of the few Manchester routes still using its original number from the original 1914 numbering system of Manchester Corporation Tramways. As a major trunk route in both the Manchester and Rochdale areas, there were many short workings associated with this route from 1932 until the demise of SELNEC. 17X - used for variations of the route after 1932 with buses travelling under this number to Victoria Avenue East; Alkrington (Mainway); Middleton (Central Gardens) (Manchester Corporation). An express or "Limited Stop" service, number 8 run as a joint service by both Manchester and Rochdale corporations, used to duplicate this route at peak hours. In the mornings, this service ran only to Manchester from Rochdale. In the evenings, it ran only from Manchester to Rochdale. No stops were observed between Middleton and Manchester in either direction of travel. In the late 1970s it was re-numbered 16 and the number of stops was increased. It was withdrawn in the 1980s. One journey each day numbered 17A travels via Stakehill Industrial Estate. The timetable is here. ↑ FirstGroup. "Manchester High Frequency Network map" (PDF). Retrieved 16 October 2011. ↑ Kirby, A. K. (1976). Middleton Tramways. Castleton, Rochdale, Lancs: Manchester Transport Museum Society. p. 51. 1 2 Kirby, A. K. (1976). Middleton Tramways. Castleton, Rochdale, Lancs: Manchester Transport Museum Society. p. 50. ↑ Lingard, John (1924). Where To Go By Tram. Castleton, Rochdale, Lancs: Manchester Transport Historical Collection. p. 29. ↑ Kirby, A. K. (1976). Middleton Tramways. Castleton, Rochdale, Lancs: Manchester Transport Museum Society. p. 70. ↑ Kirby, A. K. (1976). Middleton Tramways. Castleton, Rochdale, Lancs: Manchester Transport Museum Society. p. 72. 1 2 Eyre and Heaps, Townsin and Senior (1989). The Manchester Bus. Transport Publishing Company Limited. p. 175. ISBN 086317 151 6.